Looking north on Waverly Drive on Thursday. In the background, South Albany High School’s athletic facilities. When Diane Conrad asked the Albany City Council to remove a 20 mph school zone, she probably spoke for many motorists. The zone on Southeast Waverly Drive disrupts traffic but isn’t needed for safety, she argued, and she asked the city to remove it. Conrad, a resident of the Mennonite Village retirement community off Waverly, went before the council Wednesday with a well prepared and persuasively argued case. You can see her address to the council under “business from the public” by going to the council’s Aug. 8 meeting on cityofalbany.net, or by watching the meeting on TV (Comcast Channel 28 in Linn County, 23 in North Albany) at 7:30 every night until the next meeting. The speed limit on that segment of Waverly is 40 mph. But from 7 to 5 on school days, it’s 20 mph where the street runs past the football field of South Albany High School. The gist of Conrad’s argument was that the layout, including a 6-foot fence between the school grounds and the street, and a designated crosswalk with user-activated lights, made the speed zone unnecessary. 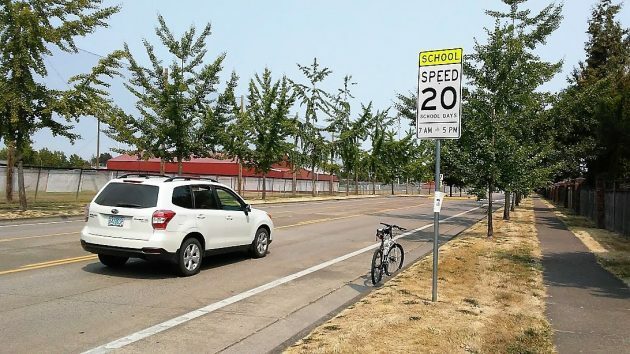 The same could be said for other school speed zones that force traffic on main thoroughfares to slow down even though students are safely ensconced in their classrooms and no children are anywhere in sight. The council did not react to the request. City Manager Peter Troedsson told me later the city staff had talked about this over the past two months with Conrad, with ODOT, and with South Albany High. “They do not support the idea of removing the zone,” he said of the school. But belief is not fact. Wanting something to be true does not make it so. Conrad may believe she should be allowed to travel at a higher rate, but that is largely the same as beliefs about life after death. There is no evidence supporting either claim. I bet the facts are that sudden slowdowns cause more accidents than an sustained speed of 40 mph. There shouldn’t be sudden slow downs. There are signs warning of the school zone ahead that any competent driver will see and should know when to start slowing down. If someone is slowing down suddenly, chances are they are already pushing the speed limit and then aren’t paying attention to the signs. The speed limit is the upper end of the speed you can travel on the road. It is not the suggested speed or required speed. The speed you should be traveling at varies by vehicle, weather, traffic, hazards, and driver ability. There is no reason to crowd the the limit. Just because 0.08% BAC is the legal limit doesn’t mean that 0.07% is the goal or recommended point to reach. People just need to to plan ahead, put down their phones and pay attention to the time, people around them, and life outside their digital existence for a while. They should also remove the school zone (until construction is complete) from Oak Grove. I’d think any school zone ticket in the area would be dismissed. These signs only cause confusion for drivers. Another annoying point is that with the Waverly location & the zone on SW Queen is that there is no “End” sign. Just a “School Zone” designation. I suppose it can be inferred the zones end where the opposing lanes zone starts. Agree. And maybe if your high school age child has not learned to NOT run out in traffic by now. You failed parenting 101. I’ve wondered about this. Why do high school students need more precautions than elementary students further north on Waverly where traffic is heavier and there are more distractions with businesses and side streets? At the very least, will the school give us a valid reason? Why investigate when you can administrate? I have questioned this. Check the speed sign in front of West Albany High School. You will see there is none. The 20 MPH sign is in front of the middle school next door. There is no reason for the 20 MPH speed zone. The actual High School is a block away, with a swimming pool and a football field between it and Waverly. There are activated crosswalks to use. As I drive this road on a daily basis I have not seen anyone but adults walking dogs using these crosswalks after school starts. To have this be a 20 MPH speed limit for the entire school day is ridiculous. For the city council to ignore this request is not responsible leadership. It seems most believe their need for speed outweighs any concern for safety. Apparently a child’s life is less important than getting to the Olive Garden 50-seconds sooner. Wouldn’t want Albanians to arrive late for all the salad and bread sticks one can consume. No, the whole point is that the speed zone does NOT enhance anyone’s safety, that it may in fact do the opposite. I’m convinced that it DOES enhance safety – everyone’s safety! Slowing down is always safer than speed. The aggravation it may cause some drivers notwithstanding. I live in Deerfield, a little south and east of picture’s location above. I’m on Waverly all the time. I would love to see the appropriate authority lower the speed limit to 30 mph from the Mennonite Village north – and keep it at 20 mph at the high school. True on so many levels. There is no evidence to suggest that slowing people down, expecting that if they are allowed to operate a heavy moving vehicle on public streets, then they have certain obligations and duties. The primary obligation is to safety, not to convenience impatient motorists who believe they are somehow invincible, incapable of poor judgement at 40-mph. The rules are simple, posted in BIG BOLD letters and numbers. Motorists wishing to compromise safety should re-route themselves to avoid this horrific traffic slowdown situation. Heaven forbid they should arrive :72 seconds later. Could more accidents happen? Anything is possible of course. Have any happened? I’ll suggest that the potential for accidents as mentioned (by someone ahead of you slowing down) would occur *only* if you are tailgating the car ahead of you. Guess who would be in-the-wrong if an accident did happen? If speed is upped, there will be a doozy of a lawsuit the first time a young person is hit by a vehicle.. Have any of you heard of global warming? Speed not only kills pedestrians and drivers more often than slower-moving vehicles, but the less you speed the less fossil fuels you burn, which are killing this planet. All of you who want to drive as fast as you want, including Hasso, are curmudgeons who act like pouting teenagers when it comes to getting their way.. Simple common sense tells you the 20 mph zone on Waverly does nothing to enhance safety. Likewise for a similar zone on Highland Drive in Corvallis by Crescent Valley High. No one wants kids safe more than I do, but doing things only for show does not help with that. Could we maybe also reconsider the rule about school buses stopping and opening their doors at every train track? Every facet of daily life is controlled by a multitude of do’s and don’ts imposed by the many layers of government. And when you dare speak up for change, the bureaucratic instinct is to adopt a defensive crouch and lash out. Those who disagree become the enemy and are never right. The bureaucracy is never wrong. Such is the plight of the hoi polloi in small town America. So opines the Oracle of Boonville North Carolina, a man of little sense but many lies. Since the signs in these areas have been put in place how many accidents have happened? My question is, why do some signs says when children are present and some have set hours? I was told the end sign is when there is a speed sign after the school zone sign but it really isn’t clear. I see some people confused and keep going the speed of the school zone long after they could speed up. Maybe shorter set hours or when children are present would work for some on Waverly, Oak Grove and elsewhere. When have you seen children crossing at 5 PM?